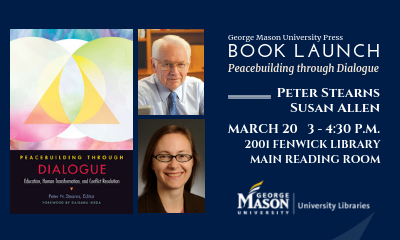 Join us for a conversation with Peter Stearns, University Professor and Provost Emeritus, and Susan Allen, Director of the Center for Peacemaking Practice, as they discuss Peacebuilding through Dialogue on Wednesday, March 20, at 3 p.m. in Fenwick 2001. Books will be available for purchase, and refreshments will be provided (courtesy of the University Bookstore). Peacebuilding through Dialogue examines the many dimensions of dialogue as a key driver of peaceful personal and social change. While most people agree on the value of dialogue, few delve into its meaning or consider its full range. The essays collected here consider dialogue in the context of teaching and learning, personal and interpersonal growth, and in conflict resolution and other situations of great change. Through these three themes, contributors from a wide variety of perspectives consider the different forms dialogue takes, the goals of the various forms, and which forms have been most successful or most challenging. With its expansive approach, the book makes an original contribution to peace studies, civic studies, education studies, organizational studies, conflict resolution studies, and dignity studies. Contributors: Susan H. Allen, George Mason University * Monisha Bajaj, University of San Francisco * Andrea Bartoli, Seton Hall University * Meenakshi Chhabra, Lesley University * Steven D. Cohen, Tufts University * Charles Gardner, Community of Sant’Egidio * Mark Farr, The Sustained Dialogue Institute * William Gaudelli, Teachers College, Columbia University * Jason Goulah, DePaul University * Donna Hicks, Harvard University * Bernice Lerner, Hebrew College * Ceasar L. McDowell, MIT * Gonzalo Obelleiro, DePaul University * Bradley Siegel, Teachers College, Columbia University * Olivier Urbain, Min-On Music Research Institute * Ion Vlad, University of San Francisco. This entry was posted in FYI, George Mason University Press, Mason Author Series, Mason Faculty/Staff, Mason Publishing, News, Speaker/Author, Special Event by Jessica Clark. Bookmark the permalink.